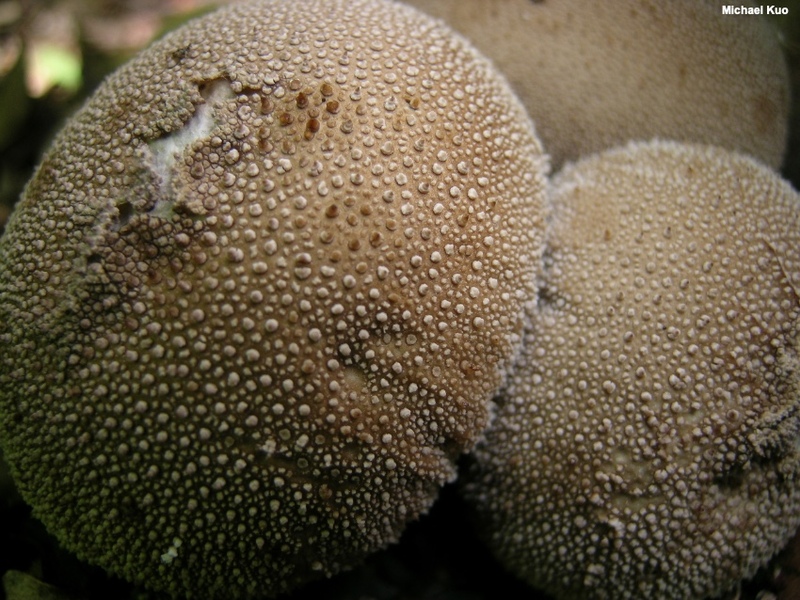 "Lycoperdon, puffed for the very first time . 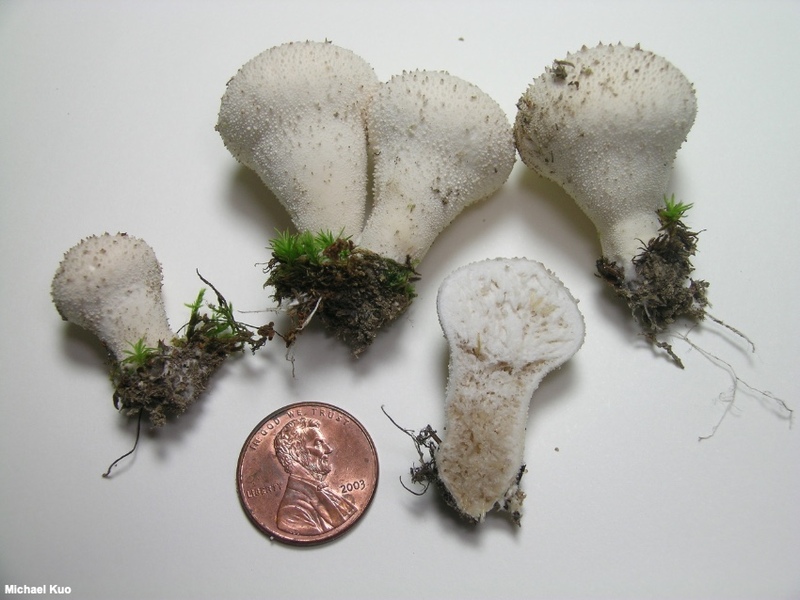 . ."
Probably the most commonly seen woodland puffball in North America, Lycoperdon perlatum is widely distributed and fairly easily recognized. I say that, and yet I have consistently misidentified it for years, assigning the name to virtually any pear-shaped, golf-ball-sized, terrestrial puffball with spines. What I was not paying enough attention to was the spines themselves. 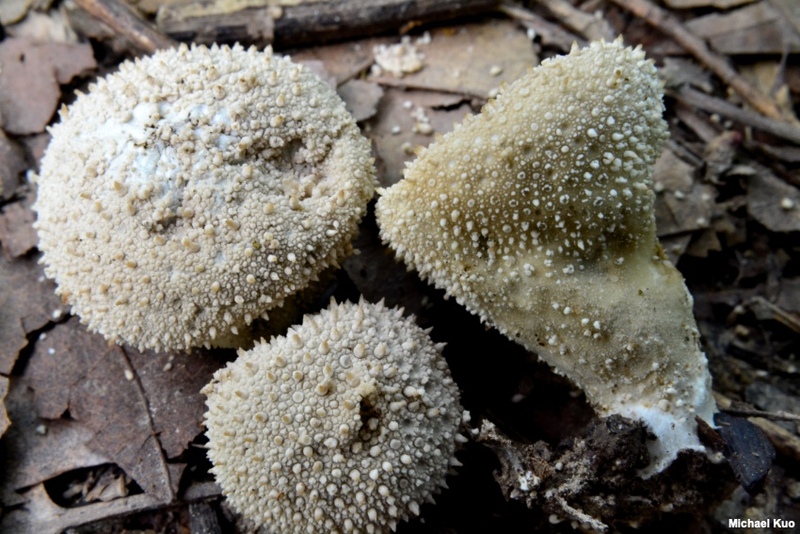 In Lycoperdon perlatum the spines are firm and cone-shaped, with relatively wide bases; they are often surrounded by shorter spines and/or granules, their tips often turn brownish—and, when they fall away, they leave a clearly defined, pock-mark scar where the base of the spine was attached. 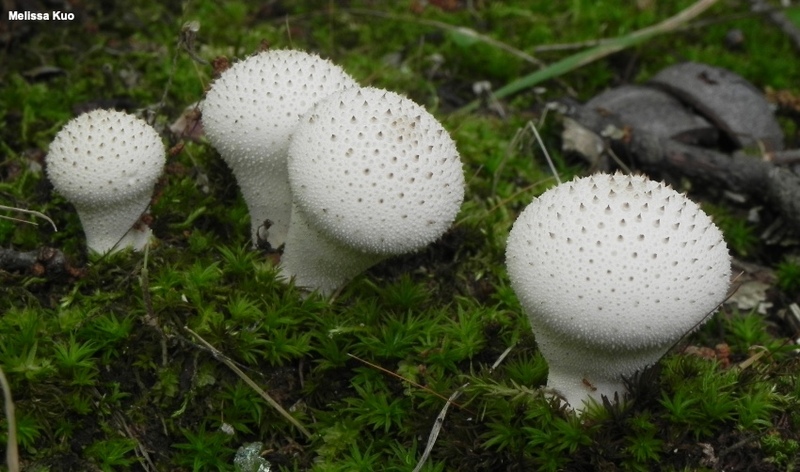 Similar puffballs tend to have softer, skinnier spines (for example Lycoperdon umbrinum or Lycoperdon pulcherrimum). 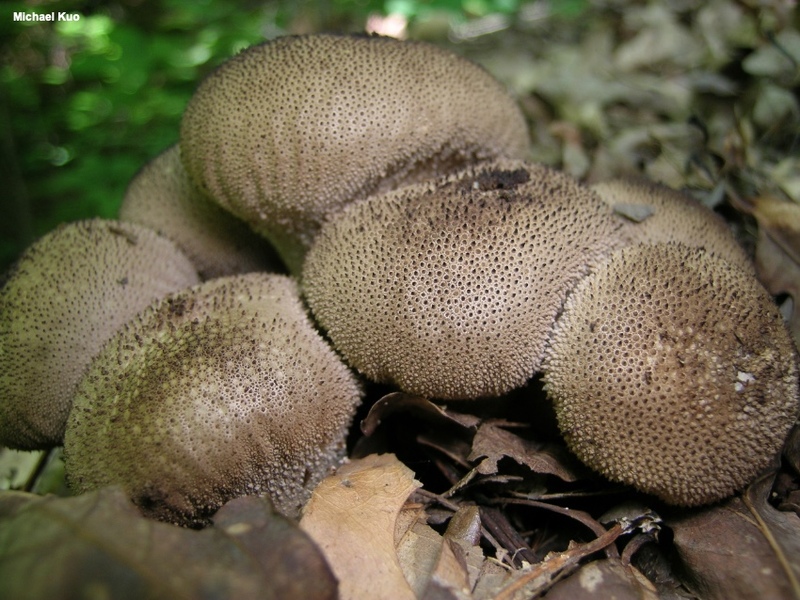 The relatively spineless Lycoperdon pyriforme is also similar in some ways, but it grows on wood. 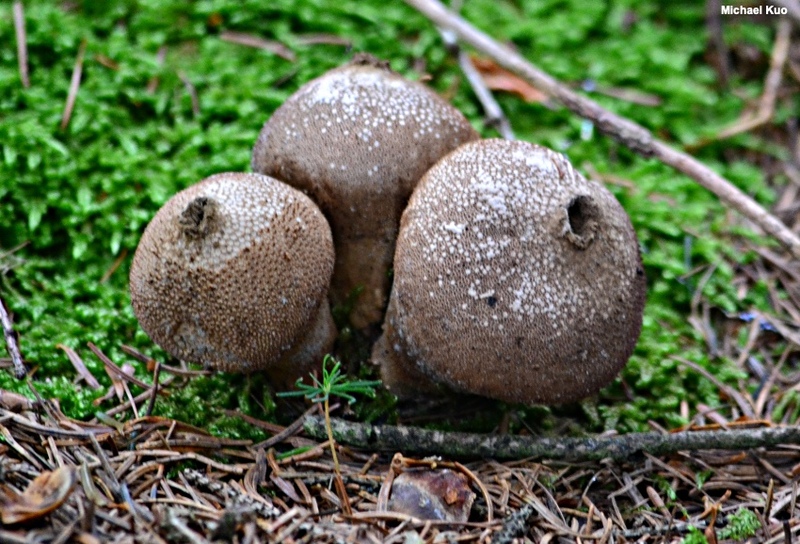 Lycoperdon gemmatum is a synonym. 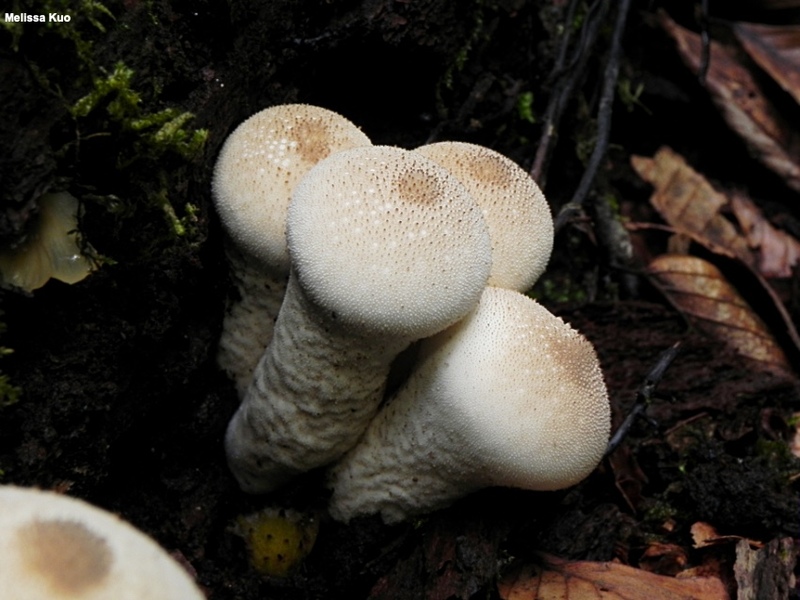 Ecology: Saprobic; growing alone, scattered, gregariously, or in clusters; in woods under hardwoods or conifers, but also common along roadsides and in urban settings; late spring through fall in temperate regions, but also over winter in warm climates; widely distributed and common in North America. The illustrated and described collections are from Illinois, Colorado, and Italy. 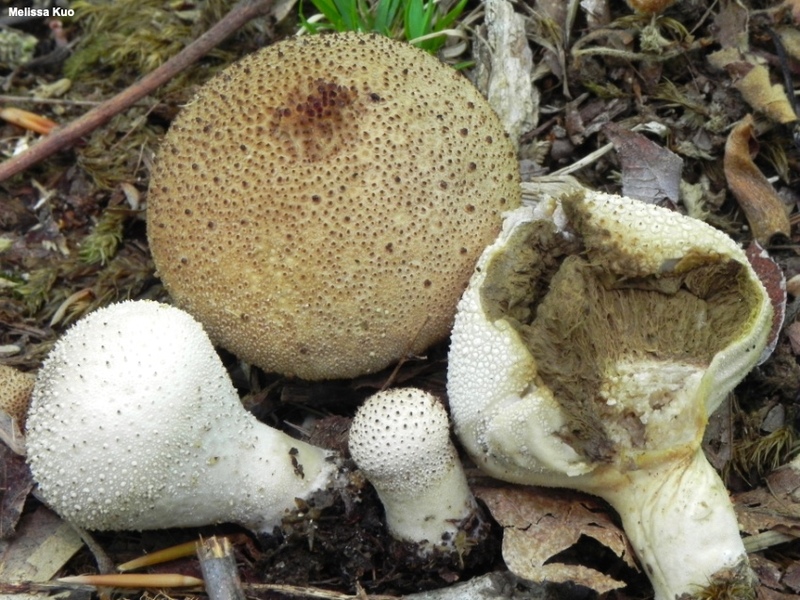 Fruiting Body: Usually shaped like an inverted pear or a cushion, with a fairly prominent sterile base and a roundish or somewhat flattened top; 2–7 cm wide; 3–8 cm high; dry; whitish to very pale brownish when young, becoming brown with age; covered when fresh and young with cone-shaped, wide-based, firm spines about 1 mm high (often with well-spaced larger spines surrounded by smaller spines and/or granules); spine tips often becoming brownish to brown; surface, after spines have fallen off, pock-marked where the spines were attached, sometimes in a reticulate pattern; outer skin paper thin; developing a central perforation through which spore powder is liberated by rain drops and wind currents; interior flesh white and spongy at first, later olive to olive brown above and yellowish to brown in the sterile base; spore powder olive brown at maturity; base attached to thin white rhizomorphs. 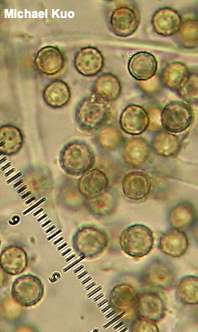 Microscopic Features: Spores 4–5 µm; globose; finely verrucose; greenish yellow in KOH. Basidia 5–6 c 5–6 µm; subglobose; 4-sterigmate with long (about 3 µm) sterigmata; smooth; hyaline to yellowish or brownish in KOH. Capillitial threads 2–5 µm wide; hyaline to olive or brown in KOH; walls 0.5–1 µm thick; with scattered tiny pores. REFERENCES: Persoon, 1796. (Fries, 1829; Saccardo, 1888; Coker & Couch, 1928; Smith, 1951; Smith, 1975; Smith, Smith & Weber, 1981; Arora, 1986; Breitenbach & Kränzlin, 1986; States, 1990; Phillips, 1991/2005; Lincoff, 1992; Metzler & Metzler, 1992; Horn, Kay & Abel, 1993; Barron, 1999; Krüger et al., 2001; Roody, 2003; Bates, 2004; Calonge et al., 2004; Calonge et al., 2005; Baseia, 2005; McNeil, 2006; Miller & Miller, 2006; Larsson & Jeppson, 2008; Bates et al., 2009; Trudell & Ammirati, 2009; Cortez et al., 2013; Kuo & Methven, 2014; Desjardin, Wood & Stevens, 2015; Evenson, 2015; Kim et al., 2016; Siegel & Schwarz, 2016; Yuri, 2016; Woehrel & Light, 2017; Elliott & Stephenson, 2018; Jeppson, 2018; Sturgeon, 2018.) Herb. Kuo 07160801, 05281008, 07061402, 10111410. Herb. DBG RMNP 2008-072, 2008-075; ROMO 2012 5022-18.